Do You Want Rafa Benitez To Succeed At Inter? Following in the giant steps of Jose Mourinho is probably the toughest job in football, and that’s exactly what Rafa Benitez must do as the new manager of Internazionale. It’s a daunting prospect and I reckon Rafa’s chances of success are slim to none. In his time at Liverpool, Rafa Benitez was one of the most divisive characters in English football. Some Liverpool fans loved him, and will always love him for Istanbul, while some disliked him intensely, both for his incredible stubbornness and the joyless football his teams played. 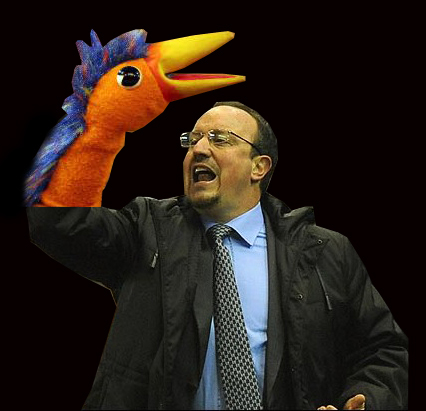 The majority of non-Liverpool fans didn’t warm to Rafa either, readily lampooning him as the ‘Fat Spanish Waiter’. I did however enjoy his feud with Alex Ferguson – and Fergie’s cabal of yes men. I suspect Benitez is in the wrong place at the worst time. Italian fooball loves big, brash characters, and after Mourinho I think Inter fans will find Benitez to be something of a dour, unlovable nerd. And expectations in Milan are so high now that even one home defeat in the league would be enough to start the whispers of discontent – Mourinho was strong enough to sshh such whispers, and anyway his teams so rarely lose (especially at home), but I don’t think Benitez knows how to handle the media, although I hear he can be charm personified when dealing with fans in person. Rafa’s main problem is that the only way for Inter is down, or to maintain their amazing level of success by winning Serie A – for the sixth time in a row – and the Champions League again. Even if Benitez manages that, and I very much doubt he will, critics may say he did it with the Special One’s team. So Benitez needs to make his mark by signing a couple of his own men and soon; Liverpool’s Javier Mascherano and Dirk Kuyt have been mentioned as targets for Inter, but I suspect only Mascherano will leave Merseyside. Inter lost 3-2 to Panathinaikos in a friendly yesterday. Two goals by Djibril Cisse and one by Sebastian Leto sunk the Italians. You might note that Benitez sold both Cisse and Leto when he was at Liverpool, and wonder if the Spaniard used up almost all of his luck in Istanbul in 2005. If so, his time at Inter may not even span one full season. I supect Rafa will fail at Inter and fail quickly. Anyway, to the question of the headline: Do you want Rafa to succeed at Inter? I do not, because I detest his scientific, overwrought approach to football, but I’d be very interested to hear your opinions either way. What is a success for Benitez? It’s a poison chalice because after a Treble where to you go? I think Rafa thrives on the underdog role. Exceeding expectations rather than meeting them. Hence his success with Valencia which (briefly) broke the Barca/Real monopoly of Spanish domestic football, and the win in Istanbul with an unfancied teams with the likes of Djimi Traore and Igor Biscan. As Inter are the dominant force in Italian football, he might struggle with the expectation. There’s also the matter of his man-management skills, or lack thereof. With hot-headed egotists like Eto’o on the books, there’s another potential stumbling block. But, if you consider the characteristics of Italian football – he could be wildly successful, with the style of play in Italy presumably fitting him like a glove. In terms of whether I want him to succeed – yeah, why not? There are very few people I would wish failure upon, and he’s not one of them. He’ll do well in his first season. But that’s totally because it’s not HIS team. Once he starts making changes, thing will inevitably go downhill. as an Interista, I reall, really want him to succeed. Otherwise we’ll have his head on a plate. He’s not really running the transfers, Branca is (mostly) taking care of it, but Rafa will want to hope like hell he’s in good contention for everything come December, otherwise he’ll be gone by January. Moratti is also very keen on the Club World Cup, anything less than a victory there and Rafa will probably get the boot. I just dont like him so hope he fails.